This block I worked on a project shift, 4 afternoons in a row in plain clothes with a partner called our Charlie shift. Primarily we use this shift to conduct curfew checks, make outstanding warrant arrests, walk through the bars and conduct special projects suited for plain clothes detail. We also support the patrol officers as it’s nice to be able to have a plain clothes unit for some calls. We fit in curfew checks through the nights between calls and project work. We made a couple warrant attempts and one was successful. Being in plain clothes and driving a vehicle that doesn’t look like an average police car allowed us to work on some drug intelligence which is always interesting. We ended up impounding a vehicle as we observed the driver and occupants use drugs and ultimately the driver was impaired by drugs. Another benefit to driving around in an inconspicuous vehicle is that drivers end up driving like they do when they don’t believe there are Police around. 2 drivers were reminded how unsafe excessive speeds are when we impounded their vehicles for 7 days and issued them multiple violation tickets as they jeopardized the public’s safety. 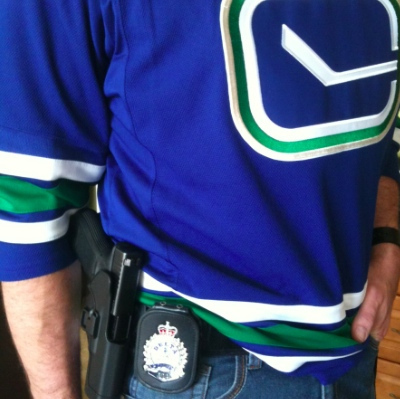 We also supported the community response to Game 1 for the Canucks in the Stanley cup playoffs. Had they won, we would have taken part in the celebration that typically occurs at Scott Rd and 72nd Ave. It’s not often I go to work wearing a hockey jersey all shift! All in all it was a very productive block with a lot of contact with previous and prolific offenders and the public. I’m back to my regular patrol shift next block.